Issue # 1- Play biting/ Nipping- Kuma has a tendency to go into these nipping frenzies during play. Those puppy teeth are sharp and Kuma is getting older so we need to nip this in the bid. Issue #2- Kuma is startled easily by sound. Kuma is also skittish in my apt. But only in my apt. He is very outgoing and friendly in public. We don’t understand this. Issue #3- We think Kuma is starting his teething phase. The Action Plan I sent to my g/f is below. We are open to suggestions as well. We need to have a plan and stick to it strictly. From now on when Kuma bites/nips, play stops immediately. Give a quick firm no and walk away quickly and ignore him. Do this AS SOON as he starts nipping, do not wait for him to stop and continue playing because he will not get the message. This may mean that we do not get to cuddle with Kuma or play with him for long periods until he learns not to nip. From now on, any nipping results in a quick firm NO! and being ignored. If he continues to follow you and nip at your heels, or continues to nip later, put him in time out immediately. Time out means Kuma is alone and NO ONE interacts with him. Time out should last no longer than 10 minutes. He may need more than one/two time outs a day. If Kuma runs when you try to put him in time out, do not chase him because then he has forced you to engage in his game. If he runs, leave the room and force him to be alone until he calms down. With patience and consistency Kuma will learn that biting/nipping is unacceptable. Patience and consistency is the name of the game. Kuma is a shy pup sometimes and is very easily startled by loud noises. This means it is extremely imperative that we get him out and about around loud noises in public at least once a day. If we do not do this he will likely turn into a shy adult dog. Even though it may be inconvenient at times, now is the window for Kuma to experience the world so that we end up with an adult dog that can be a part of our world. Taking Kuma on walks in highly populated places (mini malls, petsmarts, downtown areas, parks) is crucial for him right now. Start adding brief jogs to Kuma’s daily walk(s). I tired puppy is a well-behaved puppy. Start turning Kuma’s evening free playtime into a training session. I recommend doing “Doggy Zen” with him. This will teach him self control and the “leave it” command all at once, and will create a rewarding mental challenge for him. Reward him with treats during this session. “Doggy Zen” practice is attached separately in the email, it seems to be a step by step sequenced program. Kuma is in his teething phase. You’ll notice at times he rubs his paws on his muzzle, this is because his gums are sore. Dogs ease the uncomfortable pain of teething by chewing. Provide Kuma with ample/tempting chew toys at all times. If you can, purchase some. During this phase Kuma will need constant access to an adequate chew toy. Bully Sticks, Himalayan Chews, Ropes (he needs a new one) are great for him and he loves them. If you can, fill his Kong with treats or peanut butter, he will enjoy chewing that. Also, soaking a toy rope or a towel in water and freezing it will make a great chew toy for Kuma. He will enjoy chewing it and the ice will numb the pain in his gums. Remember, if he has a tempting chew toy, he is much less likely to want to chew on us or our property. Kuma will soon be entering his adolescent period. This is the period that puppies begin to test their boundaries become disobedient. 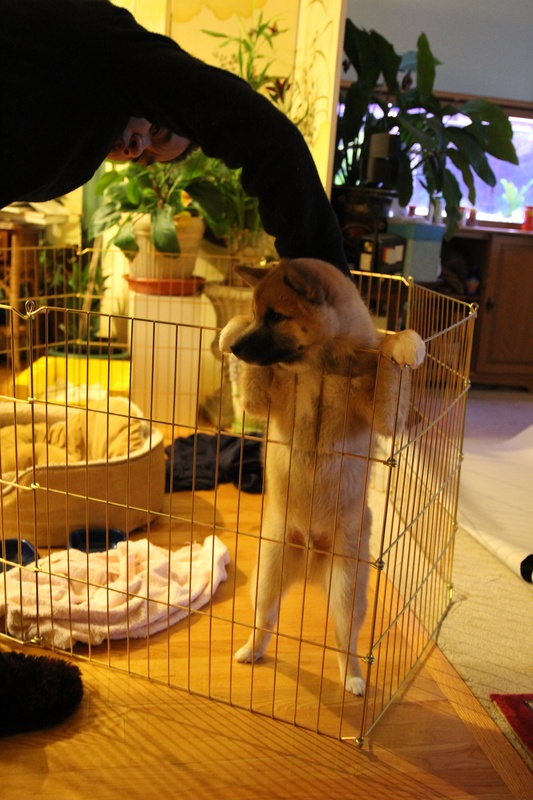 Shibas are particularly known to become little terrors around this age. I read somewhere that the vast majority of dogs surrendered to shelters are surrendered during the adolescent period. Usually because they have lost their puppy novelty appeal and their once cute bad behavior has become destructive and unpleasant. Most dog owners say the toughest time of owning a dog is during the adolescent period. We must be patient, persistent, consistent, and loving during this period, and trust that there will be light at the end of the tunnel. If we put in the hard work now (and it will likely require even more hard work from both of us) we will have a well behaved companion for a very long time. Kuma needs our leadership now more than any period in his life. He will thank us for it later. Again, we are open to any suggestions.